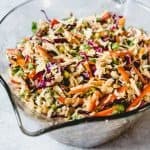 Make this easy Asian Slaw with Ginger Peanut Dressing for a delicious side or to pile on top of pulled pork sandwiches! This is a fresh and vibrant coleslaw without mayo and is sure to be a hit with your family! In a medium bowl, whisk together the rice vinegar, oils, peanut butter, soy sauce, brown sugar, ginger, and garlic. In a large bowl, combine the coleslaw mix, red cabbage, red bell pepper, carrots, green onions, and cilantro. Toss with the dressing just before serving. This cabbage and carrots will soften a bit after at least 30 minutes of chilling in the fridge after mixing with the dressing. I think this Asian slaw is best when served the day it is made.